Free For All Friday No. 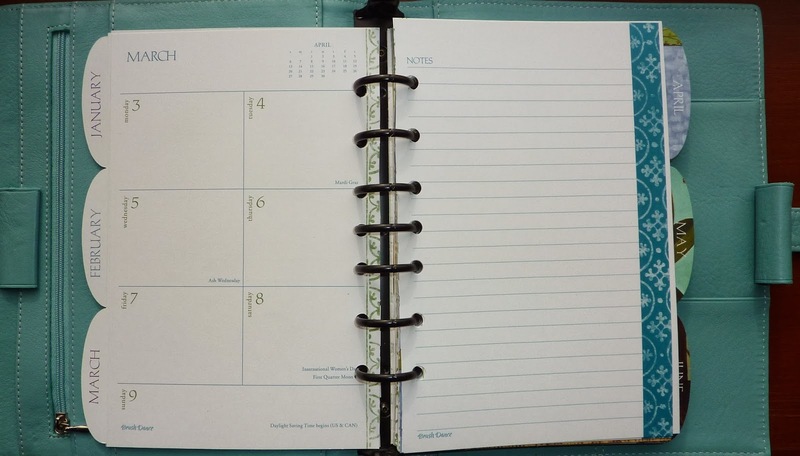 29: Your Planner Page Preference: Structured, or Open-plan? Some people like their planner pages to be very structured with designated spaces to write their appointments, tasks, tracking things like expenses or exercise, and sometimes even with boxes to check off to indicate when you have completed something. 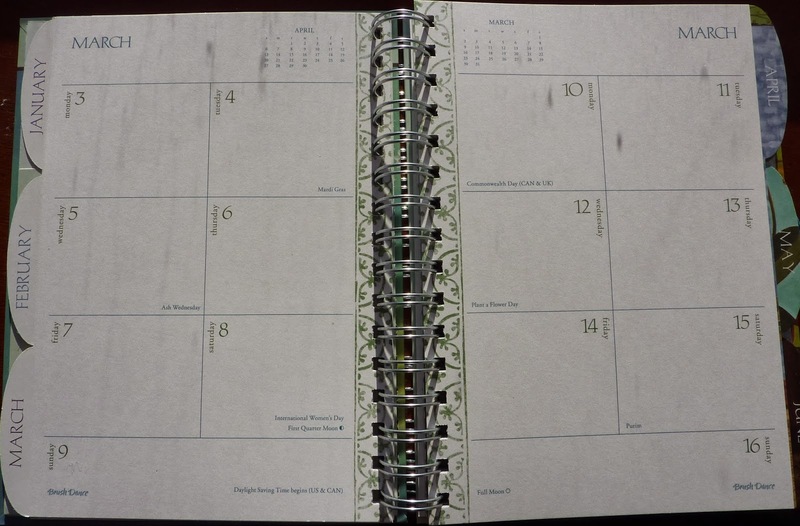 Some examples of very structured planner pages are Franklin Covey and the Women's Success Planner. Other people prefer non-formatted pages, like most Moleskine planners have, without designated spaces to write specific things. Sometimes this is so people can format the page themselves and customize it to their own needs. Other folks just like a free-form, open page. I like a medium amount of formatting in my planner. If it's too free-form, I don't have the structure I need to show me what needs to be done. If it's too formatted with too many spaces to fill and boxes to check, I feel like it's too much to keep up on and I rebel. What about you? Do you function best with a structured planner so you can fill in each space as appropriate? Or do you prefer the freedom of mainly unformatted pages? Free For All Friday No. 28: Extra pages in your planner? I like lots of extra pages and content in my planner: conversions, international phone codes, maps (lots of maps!). I especially like local- and country-specific content in my planners, like in my UK Quo Vadis diary, my Russian diary and my Diary 2000. But I realize not everyone likes these pages taking up planner space. Do you like extra pages and content in your planner? If so, what? Yes I know it's only March, but I'm already excited about next year's planners! I'm very happy to see some of them are already available, and others are coming out soon. Collins UK's 2015 business diaries are already available to order. They even have a 2016 Early Edition for people who really need to plan ahead.They also have 2015 diary inserts for Filofax and similar binders. Their 2014-2015 academic-year diaries are also available now. Moleskine's 18 month diaries are available now from Amazon UK, and Amazon.com says they'll be released on the 26th. These diaries go from July through to December of the following year, so the 2014-2015 version will get you all the way through the end of December 2015. 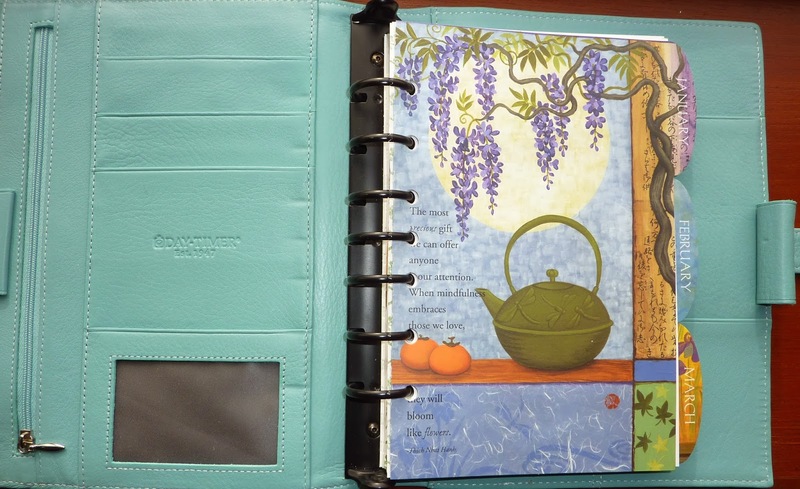 Filofax UK already has many of their diary inserts available for 2015. Qimmis.com has diary inserts for Filofax, Franklin Covey and other ring binder systems. 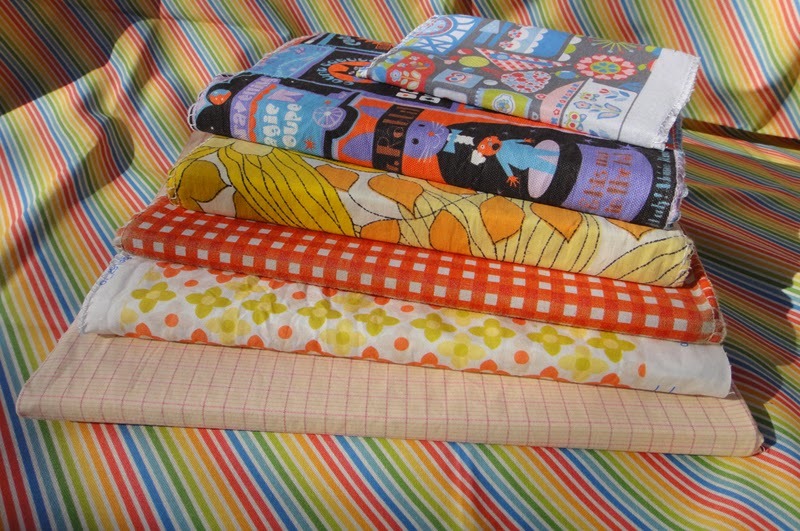 You can choose which month you want your inserts to start, and can choose 3, 6 or 12 months' worth. They have inserts available now that can start in June 2014, so if you choose 12 months of those they'll get you halfway through 2015. Moleskine's 2015 planners are due for release in May (US) and June (UK). I have already pre-ordered some from Amazon. You can see Moleskine's entire 2015 planner lineup in their catalog here. Quo Vadis UK says their 2014-2015 academic-year diaries will be available at the beginning of May, and their 2015 diaries at the end of May. Brush Dance datebooks and Organised Mum diaries are usually available in June. I can't wait to see their selections this year! Are there any 2015 planners you are eagerly anticipating? Free For All Friday No. 27: Planner page size/ writing space: How big is too big? Too-big pages lead me to write more than I can accomplish in a day, which makes me feel overwhelmed and behind. How big is too big for you? Tina commented on yesterday's post on my Bullet Journal notebook changeover asking how I use my planner along with my Bullet Journal notebook system that I described in that post. I started to write a "short" reply but it got really long so I decided to just do a separate post about it! But I can tell you lots of specifics and examples of how I use my Bullet Journal system along with my planner. I call it a Bullet Journal, but it's really not. That's a common buzzword these days, so when I say that people automatically have a pretty good idea of what I'm talking about, but I have modified the BuJo system to my own needs. First of all, NO forward planning goes in my Bullet Journal. None at all. All forward planning goes in my planner. I wrote a post last year on how I used my planner along with my day per page diary, and all of the part about how I use my planner still applies so you can see that in this post here. In today's post I will focus on how I use my Pseudo BuJo system. Some people might not like to use two separate books. But after years of trying hundreds of different planners trying to find a system that works for me, using two separate books is a small price to pay for a system that works so well for me. 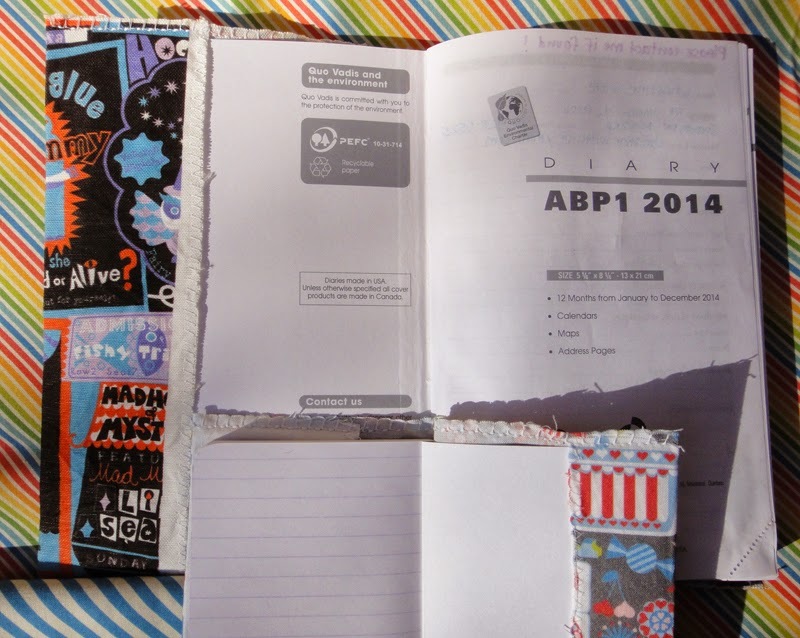 Using a separate planner allows me to plan the entire year in one book without rewriting. I use up a notebook in 3-4 months, and I would not want to have to rewrite all my forward plans several times per year. Also the two separate books help me keep their purposes separate: forward planning only in my planner, day to day recording only in my notebook. Another advantage of separate books is I can have them both open side by side so I can see today's details in relation to the rest of the week and my weekly task lists. As you saw in yesterday's post, I'm using a large unlined Moleskine notebook for my journal. I wrote some details of how I use it in my Journaling Lessons Learned post. But today I will give you some day-by-day detailed examples of how I use this notebook. The evening before, I start a fresh page and write the day and date at the top. Then I leave some space so I can write significant events right at the top of the page where I can see them easily. Then I write if my husband is traveling, and any scheduled events or appointments I have that day. Then I slot in MUST DO tasks for that day. I only write tasks I MUST DO THAT DAY, nothing that is optional because these would mix in with the Must-Do tasks, and I need to be able to see easily what I absolutely must do that day. Then if I get those done, I look at my weekly task list (in my planner) to see what else I can fit in today. Therefore my day is planned the evening before, and I wake up knowing exactly what I have to do today. As the day rolls on, I record things right in the notebook. Sometimes I use one page for a day, sometimes less, often two pages. Task. When the task is finished, I check it off. * Very important task. Do these first. ---> Follow-up action or ongoing. To continue the phone call example, under the dot information I'll write --> Sue will call me back next week when the new stock is in. That way I know the result is not complete yet. This is why I love using unlined pages: I can write between lines easily. If I'm writing on lined pages, I don't have as much space between my writing to make notes like this unless I skip lines, which feels wasteful to me. Without lines, I can always cram more writing in between. If I've written something that becomes irrelevant I line it out. For example this morning I had written Call G's friend's mom to arrange playdate tomorrow, but I had to line it out this morning because G is sick so I can't make play plans for her for tomorrow. I record emergent tasks (those things that come up during the day that you hadn't planned but get done anyway), so I have a record of when I did them. Here's a real-life example: I record online orders with the amount, which card I paid with, confirmation numbers, etc. I keep a list of these in the back and track when I ordered, when it shipped and when I received it so I make sure I'm getting everything I ordered. For example I ordered something back in October, they shipped it to me but the contents were wrong with an invoice to someone else, so they said they sent it again but I never received the replacement. I called two weeks ago (noted in my BuJo and on the monthly reference book) and they said it had been shipped, but if it does not arrive today I will be emailing them again, armed with ordering dates, confirmation numbers, phone conversation details and the entire timeline history, all thanks to details written in my BuJo and easily referenced in my monthly reference booklet. Here's another actual example from today: my daughter has been ill for a couple of days, and when my kids are ill I write their symptoms and note when they stay home from school. Thanks to my BuJo and handy-dandy monthly reference calendar, I noticed she had a similar thing back in January where she was off school the same number of days, and that she often gets a tummy ache when she has a cold. In my monthly reference booklet on the day I write "G home from school, ill" then on the day's page I write her symptoms. That way I have a quick reference of sick days, and can look up what was wrong. What else? I pretty much write everything in there. For example, yesterday my daughter was looking at a book of British birds and asked what the genus and species names meant. So in my notebook I wrote Kingdom, Phylum, Class, Order, Family, Genus, Species (remembered from "King Philip Came Over For Good Steak") and explained classifications. Years from now it will be fun to look back through my notebook and see that she was interested in taxonomy that day. Also every day I write the weather and temperature, and anything else significant. When I walk in the forest I write in my book which birds and wildlife I saw, and what flowers are blooming. Yesterday the daffodils in front of our house started blooming so I wrote that too. As I continue to do this, it will be fun to compare year to year. For example last year was a very snowy winter and spring came late. This year the winter was very mild (although rainy) and things are blooming already. This gives you a good idea of how I use my BuJo. I don't write my feelings. I did that in journals years ago and found the emotional dumping was not helpful and not anything I wanted to read again. This is just a record. I do write when I'm happy or excited about something, but again it's factual. There's no pontificating here, which I did endlessly in previous journals and did not like. I also don't decorate my BuJo. You'll find no washi tape here. I'm not artistic, and I find decorations distracting (and time consuming) so I don't do them. But, when we are waiting somewhere (like at a restaurant) and my kids are bored, I hand them my book and colored pens and let them draw. It's fun to have my kids' art in my book, and years from now I know it will be great to see their little-kid drawings in my book and see what they were thinking alongside what we were doing that exact day. All of this goes from the front of the book. Anything that happened today goes right on the page. Anything non-day-specific like my online orders tracking or list of stuff I need next time I go to Ikea goes in the back of the book. I don't index these, because it's easy to flip through the back pages to find what I'm looking for. When I first started Bullet Journaling, I mixed lists between daily pages and it was a nightmare to find anything, even with page indexing. This way is much easier for me: daily record from the front, lists from the back. I carry my journal with me absolutely everywhere, so it's important that the book is light enough or else I tend to leave it at home. That was my downfall with a dated day per page diary last year, because I need the big A5 size page but the thickness of the daily book meant it was too heavy. I'm really enjoying the large Moleskine blank notebooks because the narrow book is lighter than other comparably-sized books and is relatively thin, and very streamlined. This post turned out to be very long! And it might sound complicated, but it's actually very simple. I just write everything in my notebook, and take it with me everywhere. If you have any other questions let me know in the comments and I'll be happy to answer! I am very pleased to report that I have been so happy with my modified Bullet Journal system, I have filled my first notebook and am continuing on to a new one! First, some background if you haven't been following along: Back in December when things got really busy I started using my large plain-page Moleskine notebook as a modified Bullet Journal and experimented with three different types of indexing to see what I would actually use. You can see that experiment and its results in this post here. I learned that I work best recording my daily stuff from the front of the book and putting lists and non-day-specific notes in the back of the book, not mixing lists and notes into my daily records. When the daily stuff from the front meets the lists and notes from the back, it's time for a new notebook! You can see other journaling lessons I've learned in this post here. So now it's time for the changeover to a new notebook! I've enjoyed the freedom of blank pages so much I went for another blank-page notebook. 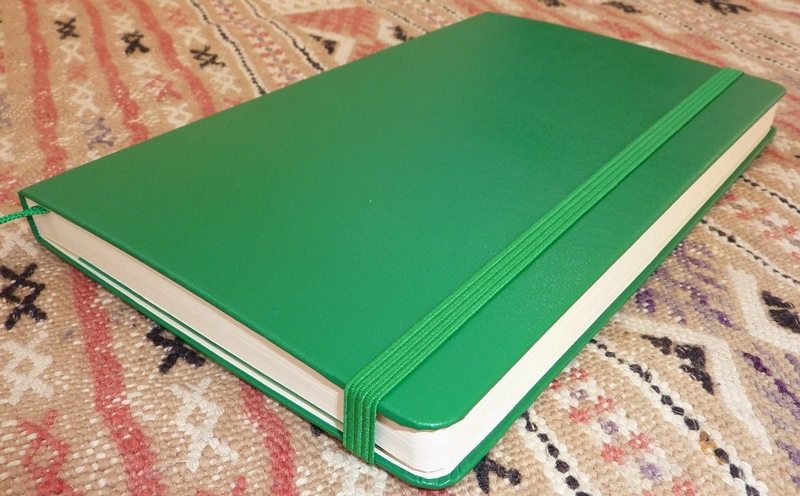 And even though Moleskine paper isn't my favorite paper in the world, I went for another Moleskine because the narrow book is lighter than a Leuchtturm or other similar-size books, and I liked this green cover for spring! 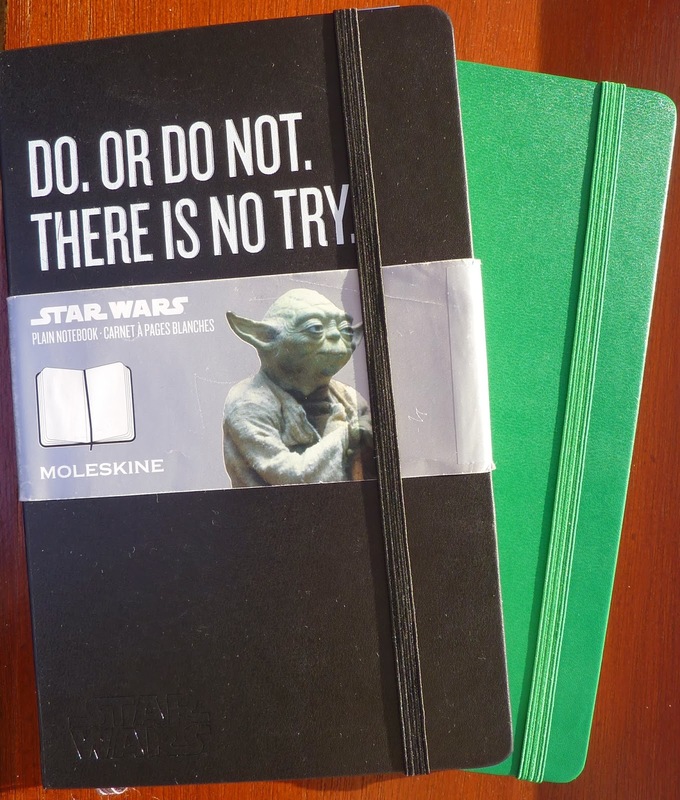 December 2013-February 2014 in Yoda notebook, March onward in green! I love how the ivory paper looks with the green cover. The only indexing system I'm using is creating a quick overview of chronological events in the monthly booklet I wrote about in this post here. The monthly booklet holds January - December 2014. On the front of the booklet I write when each notebook starts and stops so I know which book to look in for the details of any particular day or event. I'm so happy with my planner for planning and my notebook for recording, I plan to use this method indefinitely. I love the freedom of being able to jot whatever into my notebook without worrying about filling up the day's page. Yesterday this arrived in the mail: the new Moleskine softcover notebook in Orchid Purple. This notebook has plain pages, but it also comes with dotted pages which is new for Moleskine. I pre-ordered this notebook from Amazon UK and it shipped when it became available. This notebook has 196 pages, so in page number and overall book weight it is between the normal hardcover notebook (240 pages) and the Volant notebook (96 pages). It has a placemarker, an elastic closure strap and back pocket, which the Volant notebooks do not have. Because it is lighter than the notebook I'm using now, I plan to use this one in the summer when I'm on the go a lot. The green one should get me through June, so that will be perfect timing. It feels great to be happy with my system! I first heard of Qimmis from Steve's review on Philofaxy and Janet's review on This Bug's Life. I decided to head over to Qimmis.com and take a look. Wow! The first thing that struck me was the amount of choice offered. Not only can you choose which diary format you want, you can choose which month it starts in, and if you want 3, 6 or 12 months. You can choose Filofax-compatible sizes and hole configurations, US 7-ring configuration, or Swedish 4-ring. And there are several decorated styles to choose from, or plain. You can also choose your language and country holidays. I bought these inserts from the Qimmis website, Qimmis.com. I don't know if these are available anywhere else. Qimmis is located in Sweden, and all prices are in Swedish Kronor which you can convert to your currency via XE.com or similar conversion site. These inserts took about 10 days to reach me here in the UK. You'll notice the times in the daily columns only go to 4pm, which is not late enough for US and UK work hours. I don't know if they can customize the pages and change the times for you, but it's worth contacting them to ask. Then I thought I'd like to have some WeekAndNote inserts, for those weeks when I have lots of tasks and not many appointments. Then I thought I'd get some monthly pages too (which are located under Extra), with US holidays this time so I can know the UK and US holidays. Interestingly, the months do not have lines to create day boxes! It is completely open with just the date numbers and holidays. The paper is very smooth, and very white, just the way I like it! I really like the clean, uncluttered design of these pages. I chose all of these inserts to last 12 months, and all in the Vanilla style for maximum writing space on the page. Below is the Year Overview Foldout (which is under Extra) in the Peony style. I realize now it would be easy to see writing over the decorations, and I wish I'd gotten the Peony style in my diary pages. Oh well, next year! I saw another review online, unfortunately I can't remember where, and the person said you could order 3 months worth of different decorations so the images change every three months! I think that's a great idea, and I may try that next time. 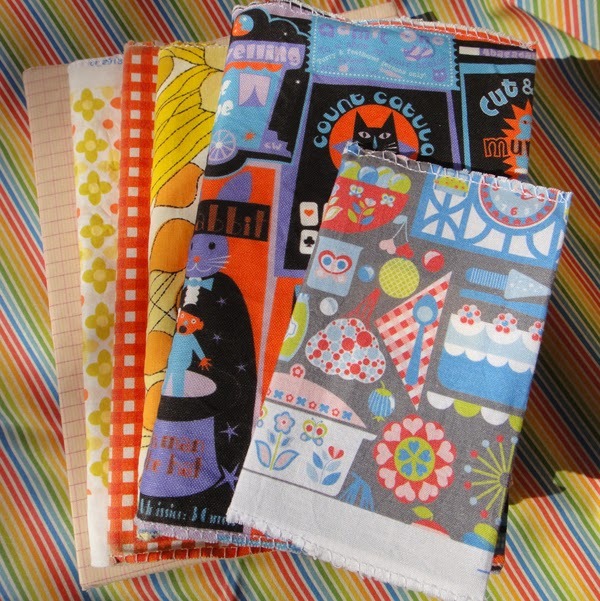 There are also lots of other Extra pages to choose from, and other diary formats too. Free For All Friday No. 26: What do you take with you, and what stays at home? I often see online that people have home binders, and they have everything in them from family schedules, household cleaning and maintenance routines, budget and financial information, recipes, crafting and more. I recently started using my Filofax as my home-only tracker of financial stuff, birthday-party and holidays planning, and annually recurring plans. I used to think I should have this stuff in my main planner, but when I realized I really only use these things at home it freed me to not have to carry it around. 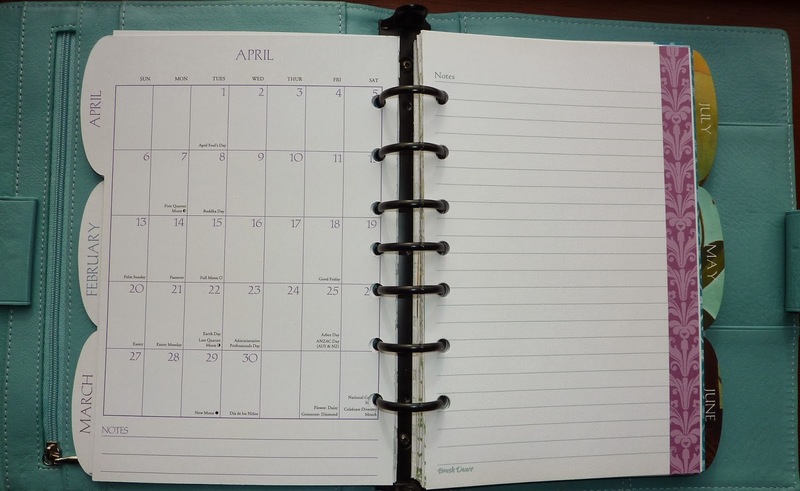 Do you have a separate planner or binder that stays at home? What's in it? And how is it different from the planner you carry with you everywhere?